Besides raising cattle, I have chickens. I have my entire life. 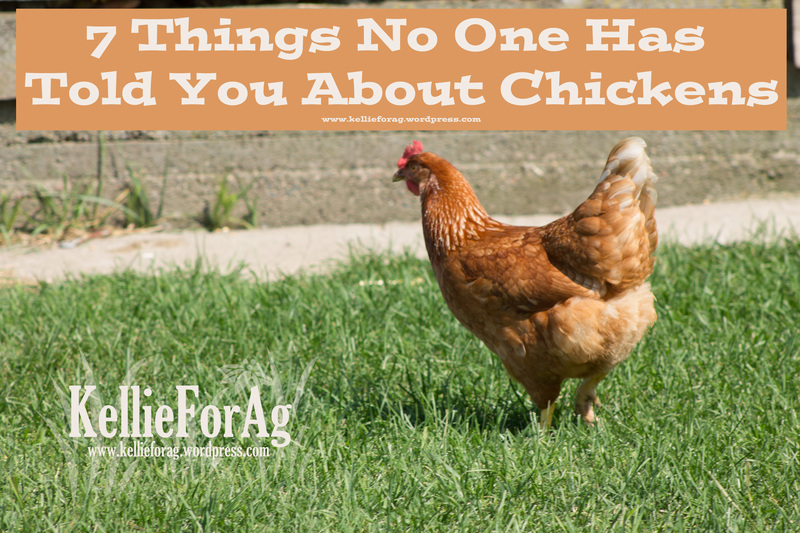 There are some things that people really don’t know about chickens and I thought I’d inform you. They’re wonderful animals with some weird attributes. Read along to find out! 1.) They smell. Real bad. Shocker. Chickens are beautiful animals with colorful feathers that shine in the sun. Looking at pictures of chickens would never hint at that fact that those beauties have an odor. No matter what you do, they will always stink. 2.) The color of their ear determines the color of their egg. True fact. I will never forget this fact. I took a poultry class at Iowa State University and this fact has stuck with me for forever. No matter what color their feathers are or how big they are, their ear color determines the egg color. 3.) They have cannibalistic tendencies. 4.) Hens don’t need a rooster to lay eggs. This is amazing to me, but quite simple if you think about it. If there’s no rooster than it’s just an unfertilized egg. Just like in humans. We can have unfertilized and fertilized eggs. This also means that a hen will lay an egg every day (or whenever/however fast her body produces it). Talk about not needing a man in your life. Go figure, right? Well I’ve come across many people that didn’t understand that chickens just go where they please. Sorry to say it, but they can’t be potty trained and they will leave their mark wherever they please. You’re asking yourself right now, “how the heck does she know this?”. Well when I walk outside and say “chick, chick” my girls come running. They know my voice and look forward to seeing me. That’s how I know. Plus other people who have chickens seem to agree with me. They become accustomed to being fed when they hear our voices so they become excited when they hear us. My dad even has a few hens that just like to follow him around the farm. 7.) They keep down the bug population. Chickens, like any bird, likes to eat bugs, flies, ants, and anything creepy crawly. Since they pick at the ground all day they help to keep the bug population at a minimum. Which is great! One of the perks of having free range chickens. So did I surprise you? Did you know everything on this list? Some of them were obvious, but I had to list those for my friends who didn’t know them (in case they have friends who don’t know either). Sometimes people don’t tell you obvious things because, well, they think it’s obvious. Even when it isn’t. I’ve had chickens my whole life so I think that everything about them is obvious, but it’s not. I didn’t even talk about how chickens mate. (The farm girl in me finds it fascinating, the proper girl in me tells me not to tell everyone, because not everyone will find it cool. On that note, if you wanna know, comment below and I’ll tell ya!) As my mother says, “You don’t have to tell everything you know!”. Until next time friends! LOL! I love chickens, too. I have a few and a few peacocks. They all have names, they each have varying personalities. And they lay eggs! We love eggs. And they really do poop everywhere and anywhere. You forgot to mention that dogs love that part about chickens, too. Which is why my Corgis dread Fridays, or Dog-Bath-Friday as they have come to know all Fridays. Sigh! They are also fantastic mousers! My girls free range during the day when I’m home and watching them catch mice is awesome. I don’t care what anyone says, chickens are smart animals!